A consciously “jazzier” show this time. It’s just the mood I was in. * Steve Coleman & Five Elements — “Formation 1” — The Mancy of Sound (Pi, 2011) ….. KZSU’s own DJ Fo finds this “more cohesive and successful than 2010’s Harvesting Semblances and Affinities.” I haven’t given it a full listen yet, so I’ll be interested to see if I get the same impression. * Nathan Clevenger Group — “Fossil Strategies” — The Evening Earth (Evander) ….. Always good to give a little love to local musicians. I discussed this album in January. I wonder if the title has anything to do with the swingy, old-fashioned elements of the composed head. * Cecil Taylor — “Enter Evening (Soft Line Structure)” — Unit Structures (Blue Note, 1966) ….. I was going to go with “Steps,” the album opener, which goes more for the jugular. But it felt too aggressive after the swingy Clevenger piece. I’ve always liked this track, which is soft but not actually slow, when you concentrate on it. Hope listeners had the patience to drift with it for 11 minutes. * Monoswezi — “Xai Xai” — Monoswezi (Parallell [yes, with four ‘L’s] 2011) ….. African music augmented by sax and clarinet. The African part comes from the Shona people of Zimbabwe — very percussion-heavy stuff, as you’d imagine. A liquid and serious sound, and the horn additions don’t try to turn it into soupy jazz. I’ll be on every Wednesday through Sept. 21, with a possible gap on Sept. 14 (I’ll let you know more as I know more). Please tune in — 9:00 a.m. to noon at 90.1-FM in the Bay Area, or kzsulive.stanford.edu. Holy cow — this entry was intended for the week heading into Aug. 7, and I apparently never hit “Publish” on it. Big mistake. I’ve modified it for this late date, but beware of any references to “this week” or “next week”! 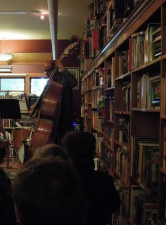 Free jazz is taking the stage for five Sundays at Bird & Beckett Books in San Francisco. It’s a great way to spend a Sunday afternoon, and you’ve got just a few more chances (for now) to take advantage of it. Bird & Beckett is a cozy, old-school bookstore, with cramped, crooked aisles nestled between shelves stuffed with old and used books. 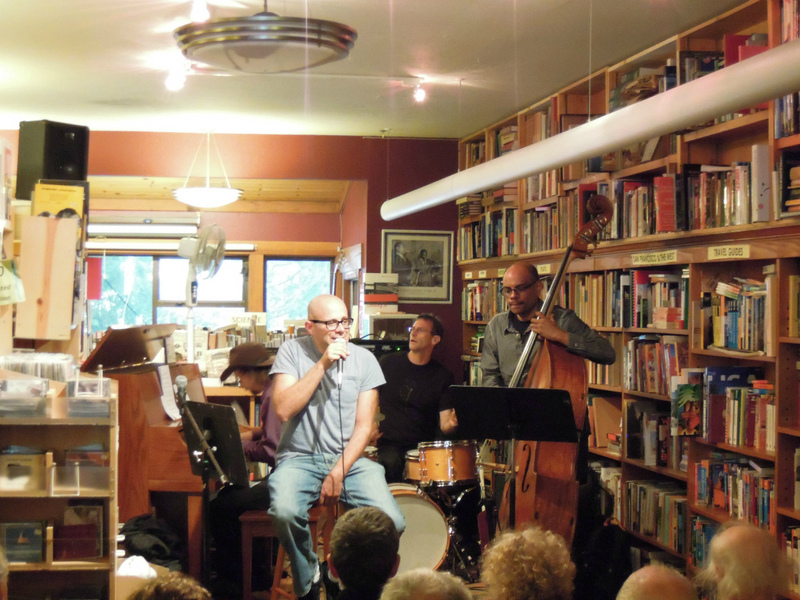 It’s a nonprofit, and as part of its mission, it provides a stage for music twice a week (in addition to poetry readings and other normal bookstore presentations). So, for five weeks, the owners are giving some edgy jazz the stage: Sundays, 4:30 p.m. to about 6:30 p.m. I had a great time checking out the first installment, on July 31. I’d never been to the Glen Park section of San Francisco; it’s quiet and upscale, with lots of thin, hilly streets. Very young couples with very little kids were walking the sidewalks. Inside the bookstore was an audience of people in their 60s exuding a very San Francisco vibe (one woman walked past me smiling, redolent of pot). And they were a good audience, rapt, filling the 20 or so chairs set out. They put out snacks, too: drinks for a small donation, and a couple of boxes of crackers apparently up for grabs. I’d feel nervous about all those half-full cups being parked on bookshelves, but nothing spilled that I could see. The program is the product of multiple artists pinging Bird & Beckett about possible shows. 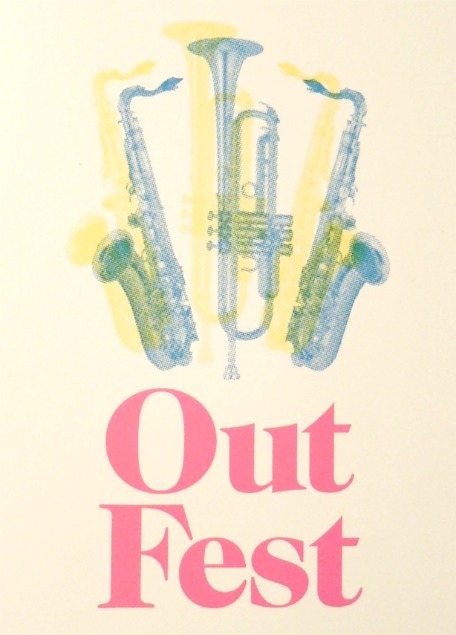 Rent Romus’ Lords of Outland — on the power-noisy side of free jazz — was one, and Jim Ryan was another. That gave Romus the idea to bundle a set of shows together into a mini-festival that the local Outsound organization could help promote. They’re calling it Out Fest. The first installment was a quartet called Time Is Now, Not Money, a quartet rooted in bebop and some standards but also willing to fly freely. Vocalist Loren Benedict of The Holly Martins was center stage, spinning his silky improvised language for a good Sunday-afternoon feel. Scott Looney on piano was in fine jazz form; it’s the most “inside” I’ve ever heard him play, and he did it with flair and style. The group’s leader seems to be bassist Bishu Chatterjee, who threw some extended techniques into some otherwise straightahead numbers and overall showed an enthusiasm for extending musical boundaries. Not everything worked — an attempt to play using the wrong side of the bow looked more interesting than it sounded — but the spirit was right. The players also paired up for improvised duets that made up about one-third of the program, maybe a little less. Standards won’t be in the house when Jim Ryan’s Forward Energy plays Aug. 7; their repertoire is improvised, although it does draw from elements of free jazz. Likewise for the final show, Aug. 28, when Rent Romus’s Lords of Outland play. Romus is planning a set that leans more on jazz-context compositions as opposed to howling electronics. My only complaint is that Glen Park shuts down early; fancy restaurants were still open at 7:00 p.m., but finding a simple espresso took effort. Lovely part of town, though. Great place for a Sunday stroll. Aug. 14 — Chuck Manning/Stu Pilorz Outfit with Ollie Duedek and Omar Aran. It’s strange and yet not-strange to be back on the air. Normally it would be like riding a bike, but we’ve had some equipment changes in the past year, so my fingers, hands, and eyes can’t rely on a decade of muscle memory. Obviously, I’m also out of touch with what we’ve got in rotation, so I’ll need to study up. But it’s good to be back. * Lisa Mezzacappa & Nightshade — “Regard de L’etoile” — Cosmic Rift (Leo, 2011) ….. I saw Nightshade’s recent concert and got a copy of this CD from Lisa. It’s hot off the presses: so new, it’s not mentioned on Leo’s web site yet. So new, the only way to get one is through Lisa (or Leo, if you’re in the U.K.). And we played it on KZSU! That felt good. I’m intending to write up more about the show and the album (and to blog the four or five music shows I got to see recently). Suffice to say, the album crosses jazz and chamber-music lines, using vibraphone and subtle electronics alongside guitar, reeds, and bass. * William Parker — “Morning Mantra” — Double Sunrise Over Neptune (AUM Fidelity, 2008) ….. As noted in 2008, this is a powerful CD with a large ensemble, featuring Bandyopadhyay’s voice as a powerful addition to the mix. This track is based on a simple bass rifthat becomes a springboard for blooming improvisations, including one by Bandyopadhyay. * Eric Hofbauer & the Infrared Band — “Pocket Chops” — Level (Creative Nation, 2011) ….. A song I remember from a Boston show two years ago. Playful, inside-swingy jazz lines that cave in as the avant-garde pauses and quietness creep in. The title was made up by a friend of Hofbauer’s, referring to the ability to flip between inside and outside jazz styles. Appropriate phrase for my show. * Eco D’Alberi — “Up Toward the Sun” — s/t (Porter, 2011) ….. Italian improv-jazz quartet fronted by Edoardo Marraffa on sax. A big, burly tenor sound in aggressive gulps. * Floored by Four — “Dougie” — s/t (Chimera, 2010) ….. Swampy psych played by Mike Watt, Nels Cline, Yuka Honda, and Dougie Bowne. I didn’t go for the snappy beat/jam of the track “Nels,” but rather for the slower, more contemplative “Dougie,” with its sparse cymbal crashes at the start, crisp bass, and lots of gloopy guitar/keyboard layers. * Andy Akiho — “No One to Know One” — No One To Know One (Innova, 2011) ….. He plays steel drums. Yes, the instrument of cruise-ship cheesiness. But he does it in a context serious enough to be on Innova, building a classical/jazz framework that doesn’t reflect the islands one bit. “Kiiro” is a very pretty, Metheny-like jazz instrumental, something that would go very well with a Chardonnay-and-brie festival audience. This particular pieces is more like Bang on a Can classical, with a small chamber ensemble backing Akiho and a manic percussive feel from the prepared steel drums. (He seems to have stuck wood blocks into them, as pianists do.) Add to that some perky singing by soprano Fay Wang, a very Amy X. Neuburg-like touch. This track blew me away. You’d never guess it had a steel drum in it. * Rhys Chatham — “The Magician” — Outdoor Spell (Northern Spy, 2011) ….. Maybe I’m the last to know, but Chatham swapped his guitar for trumpet. This album, then, is full of overdubbed trumpet, with lots of airy raspberries and curled-up squeaks. Regular trumpet notes appear, too, occasionally forming brassy drones. This 12-minute piece sets up Chatham’s trumpet overdubs with drums (Kevin Shea of Mostly Other People Do the Killing) and electric guitar (Jean-Marc Montera). I’ll be doing a fill-in show at KZSU-FM on Wednesdays 9:00 a.m. to 12:00 noon Pacific, starting this week and running through Sept. 21*. Yes, I’m back on the air! It’s going to be awkward. There really is a sense of timing and rhythm to radio DJ’ing, and it takes a while to get your chops back after even a few weeks’ break. I’ll also have to take time to sift through the newest music at the station, to see what I’ve missed this summer. So, please tune in: 90.1 FM if you’re on the peninsula, in San Jose, down Highway 101 (north of Gilroy), or in the East Bay. http://kzsulive.stanford.edu for the rest of the world and especially for office-dwellers. Nothing cheers co-workers more than a generous chunk of Tim Berne music followed by a hardy blast of Merzbow. More info about the show is here. Frith has no small part in this. Remember how I’d drawn parallels between Jack o’ the Clock (a local band with prog leanings and a strong sense of sophisticated pop) and Frith’s Cosa Brava (art songs in a rock context)? I’m not the only one. Frith himself is helping nurture an entire uprising of these kinds of bands, using his teaching position at Mills College as a pulpit. This is great news. I do love plain old pop music (Oranger, where are you? ), but it’s the prog stuff that got me down the path that eventually led to free jazz. It’s been an immensely rewarding ride, and I always find it’s exciting to discover a pop band that puts classical and adventurous jazz talents to use. Karl Evangelista, who’s half of Grex, filled me in on the specifics via email. The Mills music faculty in general — not just Frith — encourages students to transcend boundaries. Beyond that, the local scene (stacked with Mills graduates) keeps mixing jazz, chamber music, pop, and electronics. It’s a fertile environment for new ideas. The thing to stress here is that the scene is extremely open to genre cross-pollination. Frith has compared it to downtown NY in the 80’s (or, IIRC, England in the 60’s), which is apt. Members of Jack O’ the Clock recently played a couple of evenings of Stravinsky under the leadership of local avant pop wunderkind Dominique Leone. The Clocks’ rhythm section played with me and Andrew Conklin in the Tim Berne-informed free jazz quartet Host Family — and Conklin, for one, has interacted with tons of local pop/jazz/avant hybridizers out of the axis of Oberlin grads (his straight pop music is sublime). Grex plays inside of a mbaqanga/afrobeat/soul jazz combo called Dino Piranha (with local sax veteran Phillip Greenlief). It’s all really active, incestuous stuff. The Aug. 14 show is a chance to show off some of these elements on a bigger stage, literally. “We of course want to find an audience for our music and music of our ilk, but I think it’s equally relevant to convey that the local music here does belong in concert halls, on the big stages, garnering press, etc. (as opposed to hustling away in some bar in Albany),” Evangelista wrote (emphasis mine). The “find an audience” part is no small feat. Local press coverage of experimental music has thinned out, partly due to changes at the weekly papers. And, of course, there’s the ongoing issue of whether the Bay Area supports its jazz well enough, as Rachel Swan noted in the East Bay Express recently. Fred used the banner “new song movement” a while back, and I haven’t really seen it anywhere since. Whatever the case, I like the concept. The music at the GAMH will be representative of the younger music scene out here in the same way that the No New York sampler was representative of No Wave — which is to say, not really comprehensive at all, but enough to give folks a taste for some of the really daring experimentalism that’s happening right under everyone’s noses. Fred mentioned before that he’d never really heard a scene so involved as ours in integrating the experimental language that his generation innovated with the pure pop/songwriting discourse of the past few decades. There’s something legitimately new going on right now, and as a child of classic free jazz, I’m pretty happy to do some flag waving for the sort of fertile, crazily inventive environment I’d always admired and wanted to be a part of. Here, then, is your chance to be in on the New Song Movement. I agree with Karl that there’s something going on here that’s different and exciting, propelled by a group of local musicians tugging the music in new, different ways. And for those who have their doubts about “experimental” music, the songs are even catchy. This should be a heck of a show. And if you need more convincing: Most of Cosa Brava no longer lives in the Bay Area. Don’t wait for Grex and Jack o’ the Clock’s members to move eastward, too. Now’s your chance to claim some really special music as your own hometown discovery. Karl Evangelista is starting the Open Music Series tonight (Aug. 3) at the Subterranean Arthouse in Berkeley. It will hopefully be a monthly series of shows, providing another outlet in the wake of 21 Grand moving out and the Ivy Room closing its doors to the free-jazz/improv crowd (although I’m still glad they hosted the music for a while). I’ve got high hopes for the series. The Arthouse has already been hosting some creative music, and it’s conveniently nestled in downtown Berkeley. That last point is important. From my viewpoint as a spectator, it can be fun seeing experimental music in a bar or restaurant setting (a little bistro called Radio Valencia was tops on my list), but it’s not the right setting for quiet music — that is, music that makes active use of silences. Even the Outsound New Music Summit, comfortably housed in the Community Music Center theater, had to contend with the punk rock house concert next door. Luckily, they overlapped by only a few minutes, but it was still distracting. There’s a lot of work involved in putting on a series, and I’ve got the deepest appreciation for the musicians who take that job. The Arthouse is a comfortable little place. Here’s hoping they can stick around for a while and provide a haven for creative music.